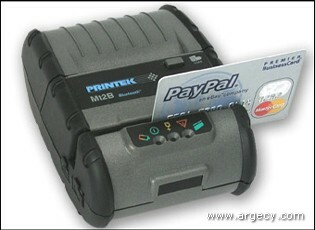 Mt2 is an ultra-lightweight two inch mobile thermal printer. Featuring a protective thermoelastic overmolding for extra durability, this thermal printer is well-suited to meet the rigorous demands of mobile printing applications. Its clamshell print-head design allows for easy paper loading and its light weight makes it comfortable to wear. An integrated three-track magnetic card reader is available as an option. For even more versatility, a variety of accessories are available including: optional three-track simultaneous read magnetic card reader; an environmental case; shoulder carrying strap; an in-vehicle adapter and more. The Mt2 Series mobile thermal printers are in-stock and ready for immediate shipment. Several different interface options, including IrDA, Bluetooth or Wi-Fi(Mt3-II and MtP models only) wireless connectivity, are offered for the Printek Mobile Printers. RS232C RJ-11 type (6-pin) interface is standard (IrDA is also standard on Mt Series). 9600 connect and Standard IrDA transfer speed. Bluetooth wireless connectivity is an option on all mobile printer models. Ease of integration into application software is a key feature of the Printek Mobile printers. An excellent selection of utility software is available. Windows 95, 98, 2000, and XP printer drivers. Demos & code samples for eVB, eVC++, C#, and Java application software.